Mourners on Thursday marked the 12th anniversary of the bombing that killed 168 people here by reaching out to victims of the Virginia Tech shootings and of violence everywhere. Presidential hopeful Rudy Giuliani told the crowd at the former site of the Alfred P. Murrah Federal Building that the response to the 1995 attack serves as an example to others recovering from violence. The people of Oklahoma City "became a model of compassion and strength, both, a model that helped us several years later get through Sept. 11 and a model that will help the people of Virginia Tech get through the terrible agonies that they are going through right now," said Giuliani, who was New York's mayor during the 2001 terrorist attacks. His comments came after participants observed 168 seconds of silence, one for each death, and before the names of the victims were read by family members. Oklahoma City mourners gather at the site each April 19 to observe the anniversary of the bombing, which also injured hundreds. Attention this year also focused on the shooting deaths of 32 people at Virginia Tech by a student who then killed himself on Monday. Giuliani said much can be learned from how rescue workers controlled their fear at the damaged federal building while they navigated danger. "We mourn and hurt and will never forget, but we don't live under fear," he said. "We owe to those we lost at Virginia Tech or to those that we lost here and on Sept. 11 that we will do everything we can to prevent future attacks." Dina Abulon, whose stepfather, Peter Avillanoza, died in the bombing, told mourners she remembered Oklahoma City not for the attack but for the "countless acts of kindness" shown to her family as they waited days to learn her stepfather's fate. "The community embraced our family. Every letter reminded me that I wasn't alone," she said, her voice trembling. Dan McKinney said the death of his wife, Linda, "literally almost killed me." "You think you are getting better and better until this day hits," McKinney said. "It just brings it all back. It's like it was yesterday." In the federal building attack, a cargo truck packed with two tons of ammonium nitrate and fuel oil was detonated in front of the nine-story federal building on April 19, 1995. 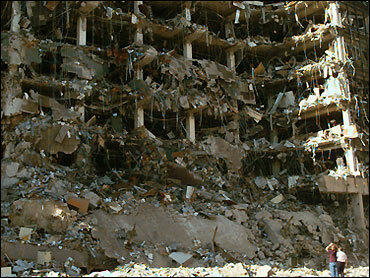 Timothy McVeigh was apprehended less than two hours later. He was convicted of federal murder charges and was executed June 11, 2001. Terry Nichols, who met McVeigh in the Army, was convicted of federal and state bombing charges and is serving life prison sentences. Another Army buddy, Michael Fortier, pleaded guilty to not telling authorities in advance about the bomb plot and agreed to testify against McVeigh and Nichols. Fortier was released from a federal prison in January 2006 after serving most of a 12-year sentence. Prosecutors said the bombing was a twisted attempt to avenge the deaths of about 80 people in the government siege at the Branch Davidian compound in Waco, Texas, exactly two years earlier.